The advantages of using LED lighting are significant. These lights are more cost-effective, more sustainable and environmentally friendly, and they are kinder to the talent. Of course there are varying levels of benefits based on which brand of LEDs are used. However, overall, they are up to 96% more energy efficient than tungsten, they produce far less heat, which means the need for cooling is minimised, they are more flexible and portable, and they have a longer lifespan. These lights have proved themselves in various applications and adoption is gaining momentum - driven in large part by the need for better performing lights with consistently high colour accuracy and increased functionality. Celebro Media Studios is a prime example. The company was established over two years ago and is the UK's first 4K television studio, used by several global broadcasters, such as the BBC, MTV and Turkish state broadcaster, TRT World. When the space was being designed and built, there was a specific focus on innovation. "We wanted to be at the forefront of technology. Everything from the monitors on the wall to the cables under the floor are suitable for 4K transmissions," said Wesley Dodd, CEO of Celebro. "This, of course, has been extended to the lighting too. Many people in our industry are sceptical when it comes to LEDs as they have probably encountered problems with too much green light, flickering, or some other kind of issue. We had to fight through those perceptions to some extent, and find a light that just didn't have any of those problems." With that in mind, Celebro fitted its studios with LEDs from British manufacturer Rotolight - initially 11 Rotolight Anova V2 bi-colour lights, which soon increased to more than 50 units. 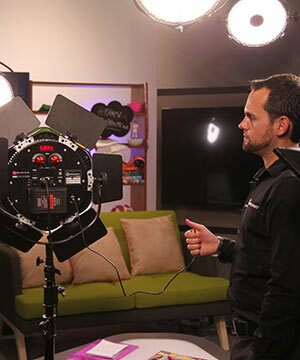 Dodd said: "The Rotolight Anova is the perfect light for working in the live television environment. We are able to light people accurately and very, very quickly, which has saved us time, mistakes on air, and a lot of money. "The power efficiency and the lack of maintenance were a massive deal for us. If we were using anything else, tungsten or fluorescents, we would be spending time replacing them." Dodd is also a big fan of the fact that the Anova features different colour temperatures on one light. "This is something that very few LEDs on the market are able to offer. At our studios, when we show people that we've got an LED light that can go from 3200 to 6300 Kelvin - that's the moment when they raise their eyebrows and realise the functionality that they're getting." Rotolight's product range - of studio, location and on-camera LED lights - delivers unparalleled levels of colour quality and functionality. The lights offer versatility, superior colour rendering and soft light output, making them ideal for cinematographers, videographers and photographers. The company's recently launched Anova PRO is especially well-suited to the studio environment. The light offers AccuColour¢ LED phosphor technology for exceptional colour rendering, and dual controls for fast, tuneable colour aided by an accurate colour temperature display. It delivers exceptional colour rendering (CRI:96+) and scores in the highest category on the independently-tested Television Lighting Consistency Index (TLCI). In addition, the Anova PRO sets itself apart from other LEDs on the market with only 48-watt power consumption at 100% output. This makes it 300% more efficient than even its LED competitors, enabling much greater run time and therefore more flexibility when running on battery on location. The Anova PRO also includes five patented, industry-first features which save significant time and money, while enabling greater creativity - including CineSFX, which allows users to recreate visual lighting effects such as fire, lightning, TV and film. Users of the Celebro studios may not always be fans of LED lighting at the start of a project, but towards the end, they are won over by the quality, versatility and functionality. "We've had a number of instances where a DoP, for example, had a bad experience with an LED light a few years ago. In one instance they refused to use the LEDs and had crates of tungsten fittings shipped in. During the duration of the commercial shoot, more and more tungstens were replaced with our Rotolight bi-colour LEDs because of the additional functionality, light quality and performance they offered - so by the time the production was finished they were only using LEDs. "Rotolight is by far my favourite light to use," explained Dodd. "Rotolight produces a beautifully soft light, the skin tones are excellent and the colour accuracy is very, very high. But also, as a studio, we find that it's a very quick light to use. For us as a studio this means cost savings and also we are able to get our customers on air sooner and more efficiently versus another LED where DoPs can spend hours perfecting the lighting."